Veteran Firefighter: Rocky Fire Has 'Most Extreme Fire Behavior I've Ever Seen' The California fire is unusually intense and unpredictable. But between climate change and the impact of decades of poor management, such wildfires may be the new normal. A firefighter monitors flames from the Rocky Fire as it approaches a home late last month. The wildfire has consumed thousands of acres in just over a week. On the northern flank of the Rocky Fire, the blackened forest floor is smoldering. The blaze, which ignited more than a week ago in Northern California, quickly engulfed miles of dry brush and oak forests, at one point consuming 20,000 acres in just a few hours. The land it's left behind is eerie, hot and powdery underfoot. Every time firefighter Gary Mahlberg sets his boot down, a sooty cloud of dust shoots up. He says he's never before encountered a wildfire this intense or hard to predict. "In the 26 years I've been in the fire service, this is the most extreme fire behavior I've ever seen," Mahlberg says. He's the captain of a four-person "strike team" from the fire department in Vacaville, Calif. The team's fire engine is currently assigned to douse out any hot spots that could flare back up and send embers flying into unburned terrain during afternoon winds. "We were told get anything that's still hot or smoking 150 feet from the roadway, because eventually they'd like to reopen Highway 20 for the locals," he says. The Rocky Fire easily jumped that road recently, burning right up to a mobile home nearby. Firefighters were able to save it, but blackened ground remains in its front yard. 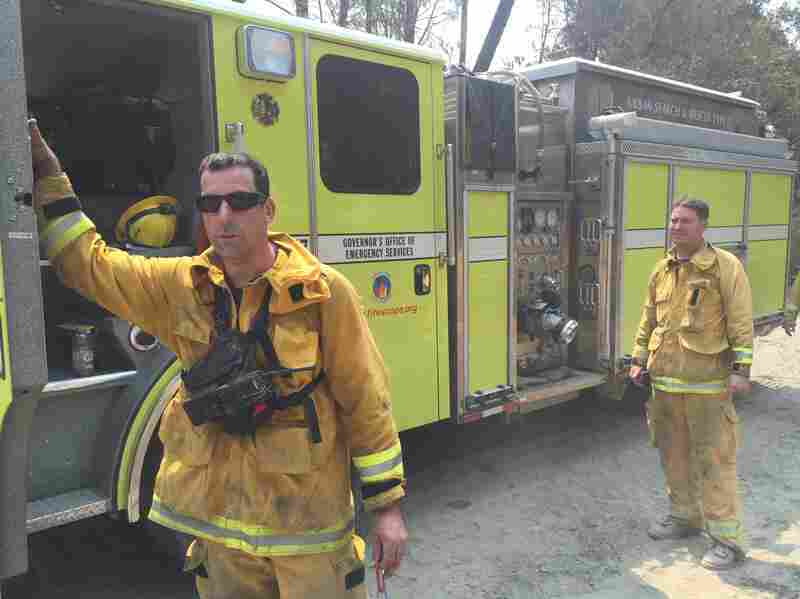 As more blazes burn like the Rocky Fire — erratic, fast moving and extremely hot and intense — firefighters like Mahlberg are having to make split-second decisions about whether a structure is worth the dangers of trying to save it. Before, they'd have maybe five minutes to assess whether a property is defensible; now, it's more like 30 seconds. Mahlberg says it's become nearly impossible to stay ahead of these wildfires. Firefighters with a California Office of Emergency Services strike team take a break from mopping up hot spots on the Rocky Fire. Career firefighters working the blaze say they've never before seen a wildfire burn with such intensity and extreme behavior. "Things are just so much more drier now," he says. "They're igniting a lot more easily than they have in the past." Four years of drought coupled with record heat is stressing these trees and shrubs. Moisture content is at record lows. Touring the destruction this week, California Gov. Jerry Brown pointed to climate change, calling the Rocky Fire an unfortunate "new normal" for the state and the West in general. 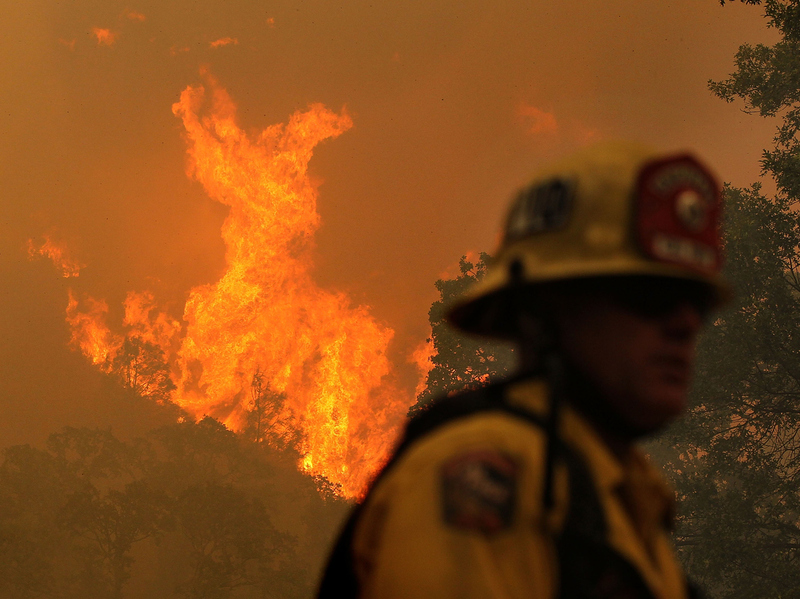 But that's only part of the story behind the Rocky Fire's extreme behavior. Wildfires in the West have been suppressed for nearly a century. And even recently, prescribed — or intentionally set, low-intensity — fires have been resisted by locals. The result is dangerously dense vegetation. Greg Guisti, a forest ecologist with the University of California, says there are consequences when unnatural fuel builds up in a changing climate. "The 'do-nothing' approach has boxed us into a corner that is making it very difficult to control situations like we have over on the Rocky Fire and to minimize its impact to local communities," Guisti says. All of this means that the job facing firefighters like Mahlberg is getting more dangerous. "Things are just burning so much more rapidly than they have in the past — even the large timber and fuels here," Mahlberg says. "It's just moving a lot quicker than we can keep up with it." There's only so much firefighters are going to be able to do to stop this kind of wildfire. And that, almost everyone agrees, has become the new norm for firefighting.